As President Donald Trump has warned, the cost of illegal immigrants on the U.S. is severe and presents a clear and present danger to our country. Now, a new report finds that illegal aliens cost us all $113 billion a year. But making the Democrats’ obstruction of a border barrier even more absurd is that best case estimates show that if a wall/fence stops 3-4% of illegal traffic into the U.S., the wall will pay for itself. The worst-case estimate is that if it stops12-14% of illegal aliens the border barrier will pay for itself. At the federal, state, and local levels, taxpayers shell out approximately $134.9 billion to cover the costs incurred by the presence of more than 12.5 million illegal aliens, and about 4.2 million citizen children of illegal aliens. 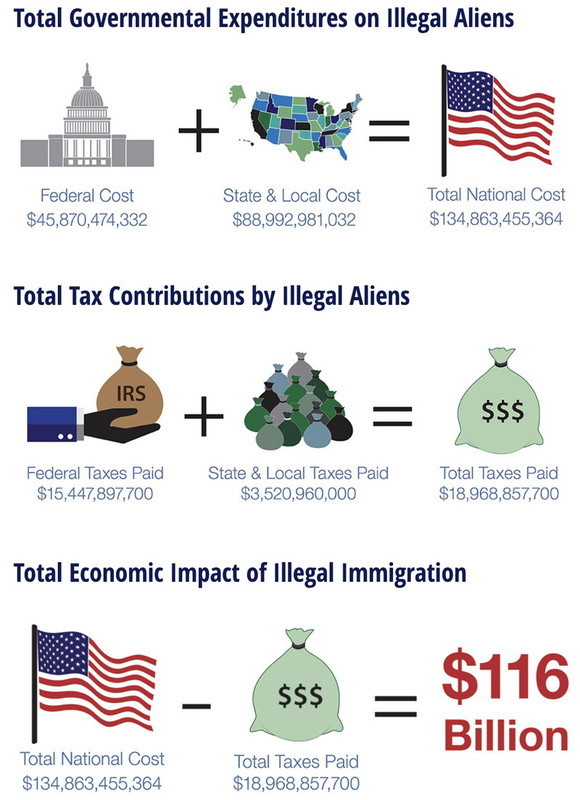 That amounts to a tax burden of approximately $8,075 per illegal alien family member and a total of $115,894,597,664. The total cost of illegal immigration to U.S. taxpayers is both staggering and crippling. In 2013, FAIR estimated the total cost to be approximately $113 billion. So, in under four years, the cost has risen nearly $3 billion. This is a disturbing and unsustainable trend. Not that the barrier will reduce the $115 billion above, but it will go a long way in preventing the next $115 billion. In fact, a recent report by the Center for Immigration Studies explains that if a wall prevents 3-4% of illegal border crossings, the wall will pay for itself. In a prior analysis, we took the likely education level of illegal border-crossers and applied fiscal estimates developed by the National Academies of Sciences, Engineering, and Medicine (NAS) for immigrants by education level — excluding their children. These estimates indicated an average lifetime net fiscal cost of $74,722 per illegal crosser — $82,191 in 2018 dollars. Analysis by the Institute for Defense Analyses (IDA) indicates that there are 1.95 to 2.28 apprehensions for every successful illegal crossing. This translates to about 170,000 to 200,000 successful illegal crossings in 2018, or 1.7 million to two million over the next 10 years, assuming this level continues. The House passed a funding bill before Christmas with $5 billion for the wall, which means the wall would have to stop or deter 3 to 4 percent (60,000) of the future illegal crossers over the next decade to pay for itself. If we make conservative alternative assumptions that illegal crossers cost half what we estimate, and we further assume the future flows will be only half the 2018 level, then the wall would have to stop or deter 12 to 14 percent of expected illegal border-crossers in the next decade. 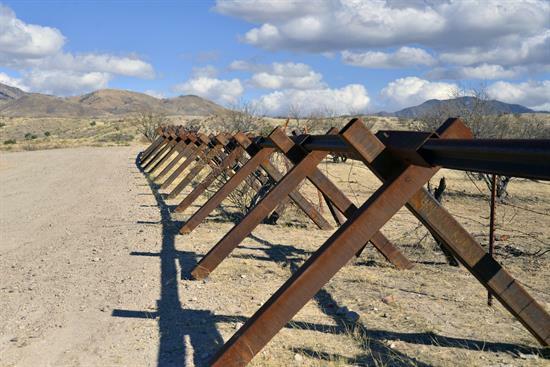 Even the 12-14% seems reasonable when one considers since the fencing in Yuma, Arizona was built, there has been a better than a 90 percent drop in illegal traffic. Folks, the U.S. Customs and Border Protection (CBP) tell us that the only way to have real border security is to have a wall at some parts of our southern border, along with more manpower and technology. According to the DHS along with the 36.3 miles of double-fencing built as part of the secure fence act but stopped by Obama, DHS has constructed 300 miles of vehicle fencing that will stop a car but not a person, and 353 miles of primary pedestrian fence. Trump’s barrier will be built only where the people on the ground believe it necessary and will replace the existing fencing where it has fallen into disrepair or where the current barriers are needed but inadequate. Not only will the fence pay for itself, but it will prevent crimes. Fewer illegal border crossings will lead to fewer crimes committed by those illegals. In Texas, which is about 9% of the country there have been at least 1,600 homicides committed by Illegal aliens and 4,800 rapes. Even if the wall only prevented 50% of those crimes is 800 saved lives, and 2,400 prevented sexual assaults in one state something to strive for? What about murders by illegal aliens in other states? What is the minimum number of ‘acceptable” murders? How many prevented deaths make a border wall more important to Democrats than their hatred of President Trump?